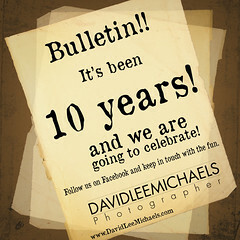 David Lee Michaels Blog » 10 Years! 10 Years! Hard to believe, it was 10 years ago this week we made it official, and opened the business full time. During the last 10 years we have been a part of Weddings, Anniversaries, Events, family, High School Senior and pet portraits. It's really cool when we look back and see the images we have created. Now 10 years later, we are looking ahead to many more, and this year we will celebrate, with lot's of opportunities for you to get the portraits you want. One of the big events we have done over the last few years is The Dog and Cat Days of Summer. Typically we have picked a Saturday in July or August, and ROCK our Limited Edition Pet Portrait Sessions all day long, collecting bags of Dog & Cat food for the Roanoke Valley SPCA's "Pet's Eat Too" program. This entire event typically books in just 1 day. This year as part of the 10th anniversary, we are expanding The Dog & Cat Days of Summer to a Thursday, Friday and Saturday. Plenty of opportunities to take part and get portraits of your Best Furry Friend! We will be announcing dates soon, so watch the website, this blog or our Facebook page. Watch for this event and more throughout the year!